JJC FK-9 professional lighting control kit allows you use your standard shoe mount flash to achieve studio-quality. The Snoot lets you control the angle and spread of your lighting. If you want to further direct your light and have even softer edges, you can use the 2" Honeycomb Grid that already be attached to the snoot. The 2.5" Honeycomb Grids are designed to produce 3 different sizes of light spread (Small, Medium and Large). The Softlight Diffuser helps you get rid of harsh light and hard shadows. The 3.5" Square Filter Holder allows you mount square filters(not included) to it. The Softbox provides soft light to the subject which is why almost every studio photographer uses it. The Softbox works in situations where bare flash is too powerful, but you still want to control the direction of your lighting. 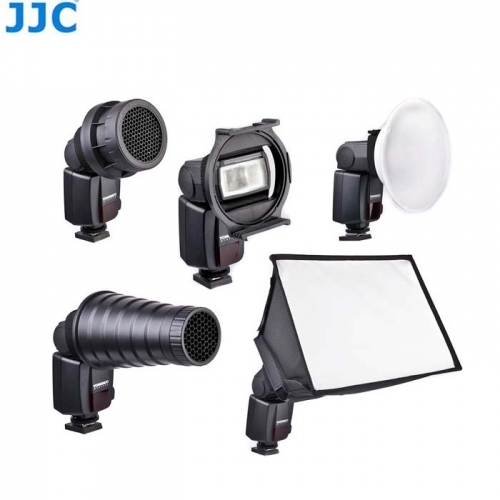 The two size of Flash Mounting Rings with velcro anti-slip band allow you mount the Snoot, 2.5” Honeycomb Grids, Softlight Diffuser, Softbox, 3.5" Square Filter Holder to the flash head. The provided Mount Rings with velcro anti-slip band make this set can be used on most flashes. This kit is particularly useful for portrait photographers to prevent harsh light and hard shadows.